This is the first time I’ve used the Just Because Stamp Set, which is a Hostess set. It’s not unusual for me to cut my stamps into two pieces if there’s an image and a sentiment on the same stamp. By doing this I can use the image for occasions that aren’t covered by the sentiment. With the stamp I used to day I was planning to leave it intact because the sentiment is in two parts. However, I changed my mind when it came to deciding how to decorate inside my card! I wanted to stamp just the top part of the vase with the leaves. My first thought was to tape over the top sentiment when I inked my stamp, remove the tape, and then stamp. This wasn’t quite so easy in practise as the sentiment is curved. I relented and cut the sentiment off, being very careful to make one continuous cut! At least I’ll be able to put the two parts of the stamp together when I want to use the complete stamp again! 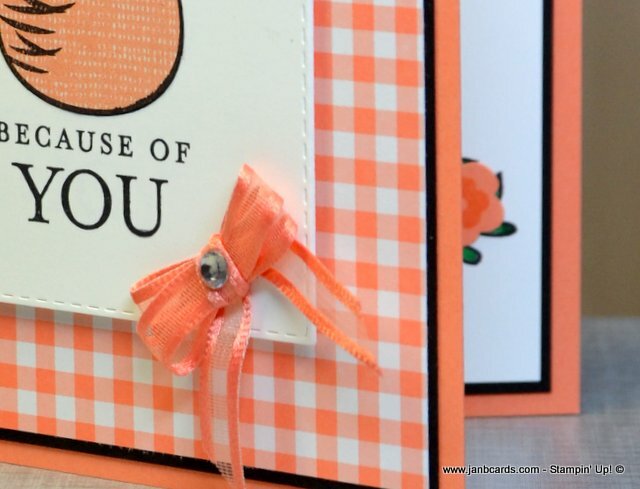 NOTE: please be aware that if you cut your stamps like this, you will make your guarantee with Stampin’ Up! null and void, because you have deliberately “damaged” your stamp. I don’t see this as an issue because once I’ve used a stamp and I’m happy with it, I’m 100% confident I won’t have any problems going forward! As I’m talking about inside the card, I might as well carry on! 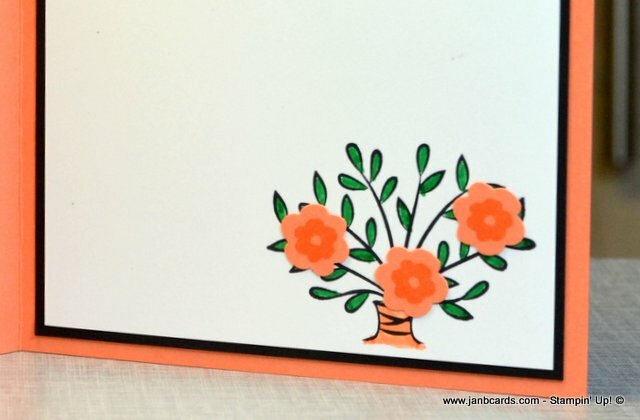 I punched the three flowers from Grapefruit Grove Cardstock (CS) using one of the Bitty Blooms Punch Pack (page 25, Spring/Summer Catalogue). However, I thought the flowers looked very bland. 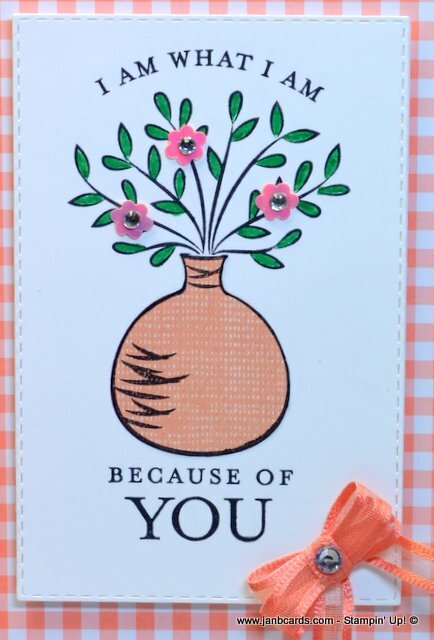 Using Grapefruit Grove Ink, I stamped the small flower from the Bloom by Bloom Stamp Set in the centre of each flower, which gave them some life. 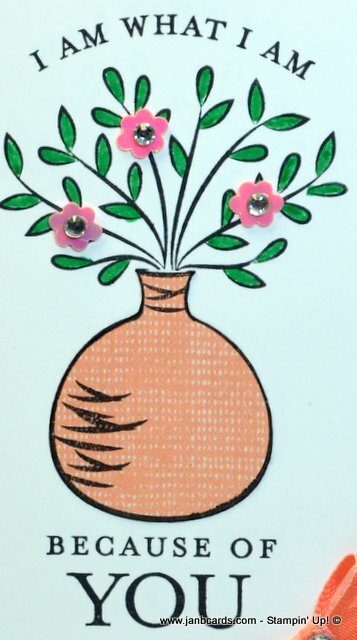 I coloured the leaves using Call Me Clover Stampin’ Write Marker Pen. This is the first time I used Bloom by Bloom but, because I only used one very small flower, I’m not counting this set as used! LOL! 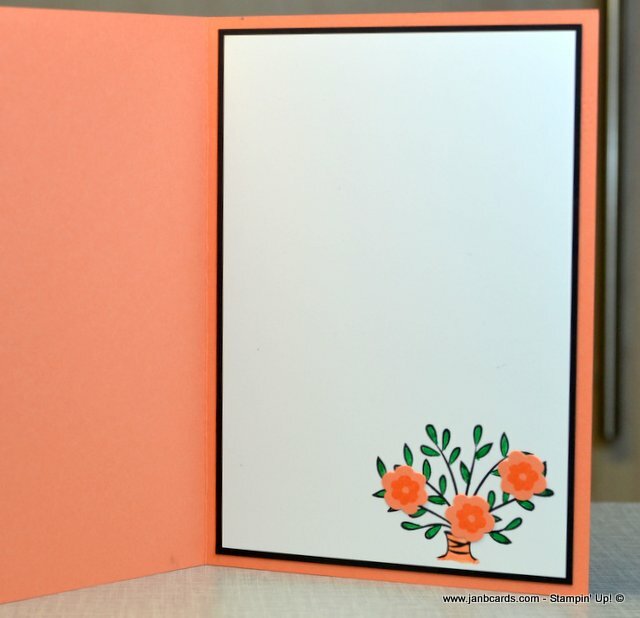 I stamped the image for the front of the card using Stazon Jet Black Ink on Whisper White CS, and coloured the leaves the same as inside the card. 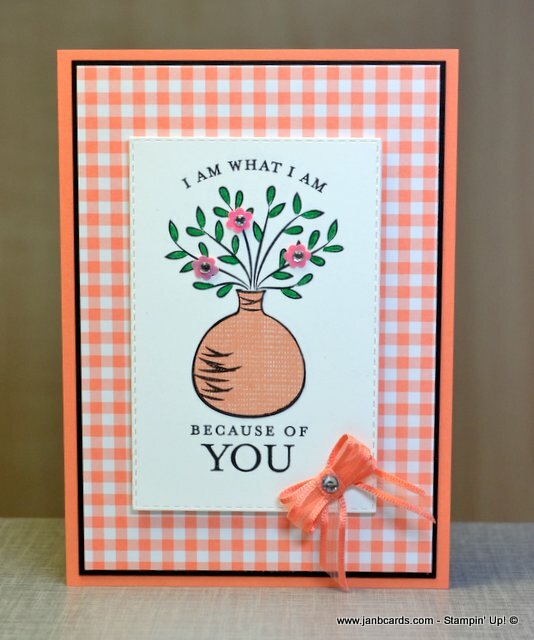 To ring the changes a bit, I stamped the vase on a piece of Grapefruit Grove DSP from Natures Poem. I cut it out and adhered it on the stamped image (this technique is known as paper piecing). I die cut the image using no. 5 die from Rectangle Stitched Framelits Dies. 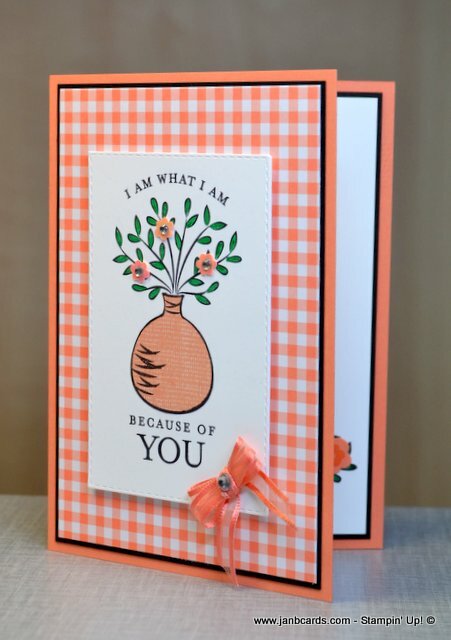 I started my card with a base of Grapefruit Grove CS, then a layer of Basic Black CS, and a top layer of Gingham Gala 6″ x 6″ DSP. I put Dimensioanals on the back of the image and centred it on the Gingham Gala. 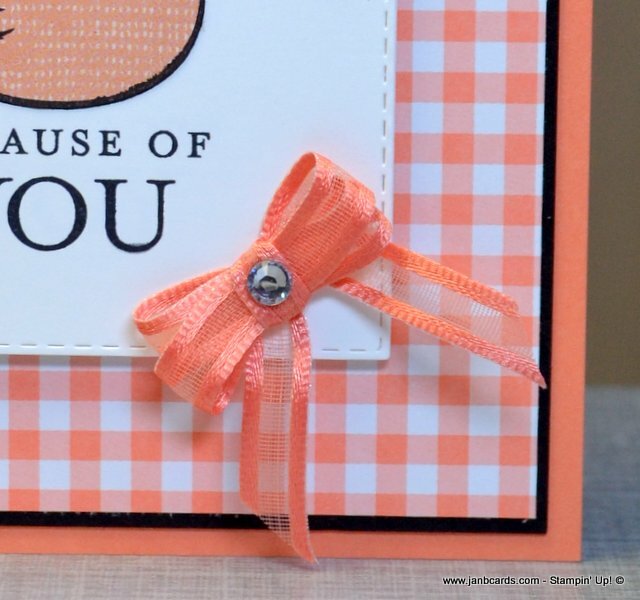 I used my bow maker – I wish we had a bow maker in our catalogue! – to make a double bow, and adhered in the bottom right-hand corner at an angle using Glue Dots. I added a Basic Rhinestone Jewel in the centre. NOTE: The ribbon I used was from Sale-a-bration, but is now sold out; I will list an alternative ribbon in the products Used below. The flowers in the leaves are from the Gingham Gala Adhesive Backed Sequins (page 35 Spring/Summer Catalogue). Although they look pink in the photographs, they are really Grapefruit Grove! It’s just a trick of the lights! I finished the flowers off by adding a small Basic Rhinestone Jewel to the centre of each! That’s about it from me today. I hope you have a lovely day, and until tomorrow, happy crafting.